Flagstaff maybe the busiest we have been since we started on the road. It is hard to be so busy and keep the blog up to date, but there are just so many things to see in this area. 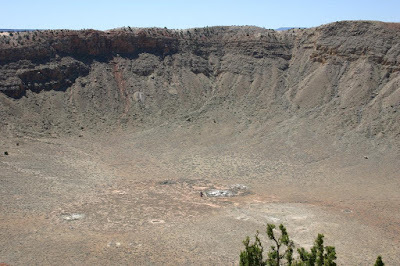 Meteor Crater is to quote their web site “The first proven, best-preserved meteor crater on earth”, it is that. A meteor crashed here 50,000 years ago and has remained remarkably intact. The crater is 4,000 feet across and 550 feet deep. Right after the impact it was probably twice as deep, but 50,000 years of erosion have filled in a bit. It is still very impressive. The meteor is believed to have been 150 feet across, weighed roughly 300,000 tons, and was traveling at a speed of 28,600 miles per hour at impact. One of the things that makes Meteor Crater unique is that is it NOT a park or national monument, it is privately owned. The Barringer family has owned the site for over 100 years and the family still runs the Meteor Crater Visitor Center. The cost to view the crater is $15.00 per person. As one guy said “that’s a lot of money to look at a hole in the ground”. As you know Kathy and I are amateur astronomers and we enjoyed the visit very much, but if you aren’t interested in astronomy you may not think it worth the money. However, where else are you going to get a chance to see preserved meteor crater. Here is the URL to their web site: http://www.meteorcrater.com . Walnut Canyon National Monument is one of those things that you just happen to stumble upon. As we were driving back from Meteor Crater to Flagstaff we saw a sign for Walnut Canyon National Monument next exit, so we went to see what it was. Walnut Canyon National Monument is a very steep canyon that is the site of cliff dwellings from about 1300 AD. These used to be referred to as Anasazi ruins but now they have several names. The name Anasazi is apparently Navaho for “ancient enemy”. The Hopi refer to these people as Hisatsinom, meaning "People of the past." The early Spanish explorers called them Sinagua, for “without water”. It is currently believed that these Native Americans are the ancestors of today’s Hopis and Zunis. A Park Volunteer that we talked with explained that the cliff dwelling walls stood for over 800 years. Apparently back in the late 1800s and early 1900s collectors started dynamiting the walls so they would have more light for collecting artifacts. You will notice that in the pictures of both Meteor Crater and Walnut Canyon it looks nice and clear. What you can’t see is that the wind is blowing very hard and it is cold! 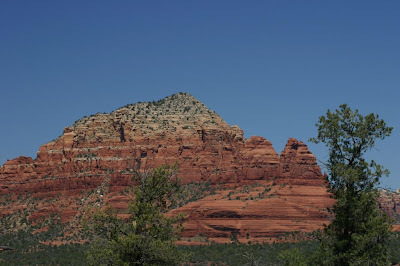 For as long as I can remember I heard people say “you really must see Oak Creek Canyon and Sedona”. So we went to see the area; it truly is a beautiful area. We started by driving down the canyon and then into Sedona. Oak Creek Canyon is a very deep canyon with lots of trees, as you begin to approach Sedona the rocks turn a very vibrant red. 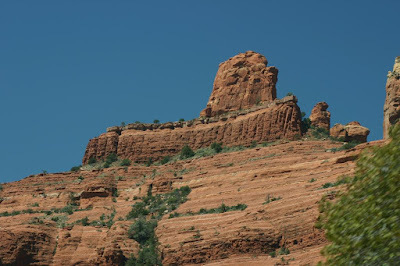 The town of Sedona is surrounded by cliffs of green junipers and red rocks it is very picturesque. Sedona is an upscale expensive tourist town that currently has its main street torn up from one end to the other. It has everything a tourist could need like T-shirt shops and Ice Cream stores (Why is it that tourist’s biggest needs are t-shirts and ice cream? ), but it also had many galleries and hotels. Just down the road from Sedona is Montezuma’s Castle National Monument. This National Monument is the most dog friendly place we have come across. They allow dogs on all trails! Even the Ranger walked up to us and asked if she could pet Raider! This is another incident of misunderstanding the Native names. The soldiers that came through this area thought the castle was built by the Aztec’s for the Emperor Montezuma after the fall of Mexico City to Cortez. However, the Aztecs never came this far north and the castle had been abandoned hundreds years before Cortez conquered the Aztecs. The monument has two distinct areas, one is Montezuma’s Well. Montezuma Well is a limestone sink formed long ago by the collapse of an immense underground cavern. Over one and a half million gallons of water a day flow continuously from the spring at the bottom of the well. There are the remains of several cliff dwellings and pueblos in this area and a beautiful stream. The second part of Montezuma’s Castle National Monument is the castle itself about 11 miles downstream from Montezuma’s Well. 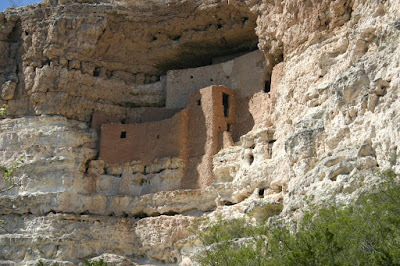 This is the best preserved and by far the biggest cliff dwelling we have seen so far. The castle is a 20 room, 5 story structure built 70 feet above the valley floor. 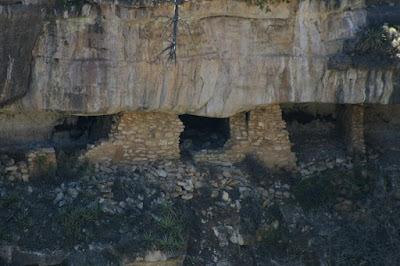 All of these structures were built and then abandoned during the 1100 – 1300s by the Anasazi, Hisatsinom, Sinagua people. The real question is why? Why did they abandon these sites after centuries of occupation? Clearly here at Montezuma’s Castle National Monument it wasn’t due to a lack of water with a spring producing one and half million gallons of water a day. So far no one has come up with an explanation. This was the first day we had temperatures in the 70s in months. Of course, we were about 3500 feet lower than Flagstaff. A few days ago I wrote about our visit to the Lowell Observatory. This is a very historic spot for astronomy and we got to see the historic telescopes and equipment that had been used there over the years. The Observatory also has evening visits where you can actually look through some of the telescopes. How could anyone pass up on a chance to actually look through a 102 year old telescope that is still one of the finest refractor telescopes ever made? So we went to one of the evening visits and got to look through the 24 inch Alvan Clark telescope built in 1896, which Percival Lowell used and a 16 inch telescope built in 1963. Unfortunately it wasn’t a good night for observing because there was a quarter moon out, that makes the sky too bright and the wind as always was blowing. Although it was only blowing about 14 miles per hour, a windy night makes the images in the telescope dance and twinkle. So we got a dancing twinkling view of Saturn through the 25 inch telescope. The rings and the divisions between the rings were visible. 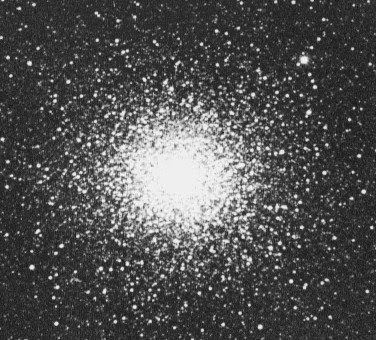 Through the 16 inch telescope we had a washed out view of M3 a globular star cluster.